Having an electric lantern for camping eliminates the need to carry messy liquid fuel or propane bottles that add weight and bulk to your pack. Electric lanterns come in all sizes with various features that will please everyone. Coleman is often the first brand that people think of when they are shopping for camping gear. It stands to reason since Coleman has been manufacturing lantern since 1901. With everything from tents to sleeping bags and camping stoves to outdoor fireplaces, you will find things you never even knew you needed when you shop Coleman. It is no surprise, then, that Coleman offers 27 models of electric lanterns for camping, boating or emergency use. They have many different features to meet your every need. New in August 2007 is the Exponent CR123A Lithium Pack Away Lantern. This weather resistant lantern weighs less than five ounces. Lithium batteries in this lantern provide 12 hours of light on the low setting as five hours on high. It even includes an emergency strobe feature. Rechargeable lanterns are also offered by Coleman. A single charge powers the Retro Rechargeable Family-Sized lantern for up to nine hours. Included is a 12 volt adaptor but it can easily be recharged from a 120 volt AC or 12 volt DC outlet. 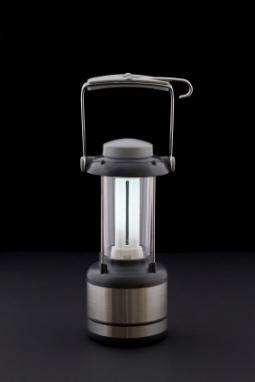 The Rugged Rechargeable Family-Sized lantern is similar. A single charge operates six hours on high or nine hours on low. While recharging, you still have the amber glow of a nightlight so you are never completely in the dark. Don't you hate it when you are snuggled in your sleeping bag, ready to fall asleep, when you realize that the lantern is still brightly shining and you have to crawl out to turn it off? Solve this problem before your next outing by getting a remote control lantern.The Retro Remote Control Family-Sized lantern can be turned off from 40 feet away. Features include a nightlight, bright 15 watt fluorescent bulb and up to 30 hours of light with using eight D cell batteries. If you need something that won't take up quite as much space in your camping gear, try the Remote Control Pack-Away lantern. This lantern has a built in carry case and provides 12 to 24 hours of light using eight D cell batteries. The handy remote control feature turns the lantern on or off from up to 50 feet away. For many campers, smaller is better. If you enjoy ultralight backpacking or simply have limited space for all of your gear, you'll appreciate Coleman's mini lanterns. Small, pack-away styles are great to slip into your pack. Larger models run on D cell batteries and smaller models require AA size. Just to be safe, it is a good idea to bring extra batteries so you aren't left in the dark. Retro-styled lanterns also come in small sizes for easy toting. For example, the 4AA Camp lantern is small and bright. Even better, it is weather resistant. Other companies make electric lanterns for camping as well. One good option is the Emergency Pro Flashlight Radio which provides needed light with other important features. Vector markets a handy lantern called the Power On Board TrailTracker. Not only do you get light through DC or hand-crank power, but you get AM/FM and NOAA radio stations as well. GE's Steelbeam Lantern is another smart choice. This weather resistant lantern provides up to 16 hours of light with four D cell batteries. You may find that having several styles of electric lanterns is a great way to have peace of mind. Have a mini style for your car in case of bad weather or to have light if you need to change a tire in the dark. Keep one in your RV. Have several in your home for year round safety in an emergency. Your boat is another great place to have an extra light. Imagine how handy the strobe feature can be if you find yourself off course. You'll find many uses for an electric lantern, and with so many to choose from, you will easily find one for every possible need.